Bdiscom RF Generator – Matching Network Troubleshooting Instructions : Manitou Systems Inc. 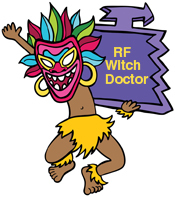 This page of the RF Witch Doctor Chronicles provide details on the installation, use and troubleshooting of the Bdiscom Model BDS-HF-AFP RF power generator (all power levels) and the Model BDS-AMN automatic impedance matching network. Problem: The BDS-AMN will not start the automatic tuning process and the plasma discharge will not ignite. The BDS-HF-AFP control software is designed to provide 2 modes of operation: (“p1”) where the automatic tuner will not start UNTIL there is plasma ignition AND a DC Bias (DCV field on the display) above 20 volts is present. The p1 setting requires the tuner to be pre-set at or close to the plasma strike point – enabling the plasma to strike immediately upon turning the RF power to ON. A second operational mode is to set the software to “p0” which will start the tuner’s servo motors 1 second AFTER the RF is turned ON. Using this mode, the tuner will locate the high voltage plasma strike point, ignite the plasma and then, tune for minimum reflected power. It is suggested to still use the tuner’s preset function to minimize the strike time and motor operation. The p1 and p0 control modes may be selected using the unit’s serial interface port. Please consult the owner’s manual for additional information. Note that the p0 mode is ALWAYS required when using this RF system with an inductive plasma source load (as this type of load does not develop and DC Bias voltage.